Every month in New York, there are a bewildering number of new dishes to eat, drinks to imbibe, and food-themed events to attend. Often, the hardest part is just figuring out what’s really worth your limited time. So Grub kicks off each month with a curated selection of dishes, drinks, and events that should absolutely be on your agenda. Make your plans now. 1. Celebrate the holidays with a Greenpoint restaurant’s new meaty group dinners. Brooklyn’s Cherry Point recently got a new chef in Ed Szymanski, who has worked everywhere from Lyle’s in London to Quintonil in Mexico City to the Beatrice Inn here in New York. Just in time for holiday gatherings, he’s introduced a pair of group menus (both are $65 per person). For the first, Szymanski goes all-in on beef with dishes like bone marrow flatbread, grilled tongue with mustard, braised cheek and oyster pie, and grilled rib of beef. The other option is heavy on game birds. There’s barbecued quail and smoked squab with flatbreads, pheasant with apples and bread sauce, and grilled wild duck. Each culminates in a dessert of blackberries and baked cream. 2. Seek out the best Christmas present of all: breakfast tacos at Superiority Burger. On December 25, Superiority Burger will swing its doors open at breakfast for its Taqueria Rizzo pop-up, from 9 a.m. to noon. Run by Superiority cook Dave Rizzo, it’s a very occasional pop-up for vegetarian breakfast tacos made in the style of Rizzo’s native San Antonio. Like last time, on July 4, there will be four choices of taco: soy-rizo and egg, migas, potato and egg, and bean and cheese. For dessert, there’s candy-cane gelato, pink cake, and conchas. 3. 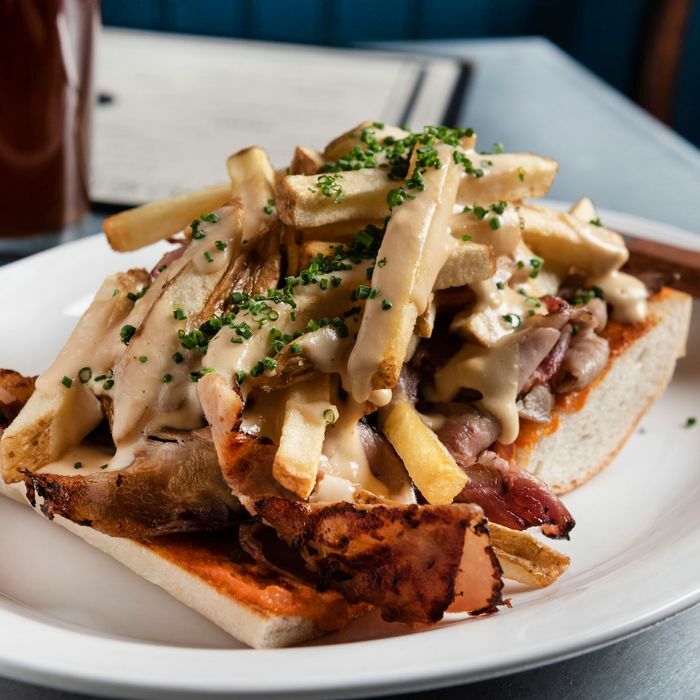 Eat a Belgian sandwich stuffed with roast ham and French fries. The owners of East Williamsburg’s Little King have expanded with a new restaurant and bar specializing in Belgian food and natural wine. Open all day, Benelux serves three versions of moules-frites ($18); oysters raw ($15 for a half dozen), smoked ($12), or Florentine ($14); and a handful of other dishes. There are two kinds of very American burgers ($13 and $15), complemented by the over-the-top Belgian sandwich called a mitraillete ($16). Served on a baguette, it’s made with roasted ham, bread and butter pickles, and a bunch of fries. Why eat your fries on the side, anyway? 4. Have latkes and more at a Russian Hanukkah dinner. The Jewish Food Society regularly throws fun and fascinating food events, and the next will be this modern Russian Hanukkah dinner. For the December 6 event (7 p.m. to 10 p.m.; tickets are $70), the organization’s former chef-in-residence Sasha Shor will cook latkes with smoked fish, crispy Cornish hens, and a dessert with La Newyorkina’s Fany Gerson. Afterward, she’ll speak with writer Adam Sachs about keeping family recipes alive. 5. Order a very chef-y fruitcake. Who says fruitcake can’t be good? Not Ned Baldwin, who on December 7 will bring his annual fruitcake sale back to his popular Tribeca spot Houseman. The chef spent several years working on his recipe, pulling from different traditions. His version ($42, available for shipping) is made with candied cherries, oranges, and ginger, toasted walnuts, and a good soaking in rum. It could make for a nice holiday gift, if you can hold off on eating it. 6. Head to talks with the authors of two of the fall’s most notable cookbooks. Books Are Magic has a pair of back-to-back events to keep on your radar. First, on December 3 from 7:30 to 8:30 p.m. (RSVP here), sisters and chefs Michelle and Suzanne Rousseau will be joined by writer Korsha Wilson to talk about their new Caribbean cookbook Provisions. The next day (RSVP here) at the same time, Jeremiah Stone and Fabián von Hauske of Contra and Wildair will talk about their A Very Serious Cookbook with their co-author Alison Roman and Bon Appétit deputy editor Julia Kramer. 7. Feel better about drinking too many cocktails at a charitable Christmas pop-up. Through December 31, Carroll Gardens’ Leyenda will turn into a Christmas pop-up with a charitable bent. They’re calling it Sleyenda, outfitting the bar with holiday tree lights and other seasonal decorations, and revamping the menu with drinks like Grandma’s Secret Stash (allspice dram, vanilla, Smith and Cross rum, and black tea). A dollar from every new Sleyenda cocktail goes to the Global Fund for Women, the New York Women’s Foundation, Outsmart NYC, and the Me Too Movement. 8. Join Carla Hall for a benefit dinner. On December 11, the Brownsville Community Culinary Center will host Carla Hall for a benefit dinner (tickets are $200). Starting at 6:30 p.m., she’ll serve a five-course menu of dishes from her book Carla Hall’s Soul Food: Everyday and Celebration. Proceeds will benefit the Melting Pot Foundation and the BCCC. 9. Pretend it’s not dark at 4 p.m. at an Amalfi Coast restaurant’s New York pop-up. A seaside Italian restaurant visited by the likes of Beyoncé has made the voyage to New York. The Amalfi Coast’s La Conca Del Sogno will pop up at Chefs Club from December 3 through January 1, serving its spaghetti alla Nerano, Italian wines, and more. Reservations can be made here; Amalfi sunshine not included. 10. Spend a Saturday eating lots of cheese in Queens. Queens food guru (and occasional Grub Street contributor) Joe DiStefano and his New York Epicurean Events will host their fourth annual Great Northeast Cheese Fest. Happening tomorrow, December 1 (tickets are $50 to $120) at the Flushing Town Hall from 6 p.m. to 9 p.m., there will be freshly made mozzarella from Kesté’s Roberto Caporuscio and fondue parmigiana with Cabot cheddar and gruyere from M. Wells’ Hugue Dufour. Not to mention lots of great cheese from the likes of Consider Bardwell Farm, as well as drinks from Mikkeller NYC and Brooklyn Cider House. 11. Celebrate a Brooklyn cider maker’s first year in business. Speaking of the Brooklyn Cider House, the Bushwick bar, restaurant, and apple booze producer will celebrate its first anniversary on December 13. To ring it in, there will be a party starting at 8 p.m. with a a dance floor, cocktails, free tostadas, and potato tortillas, and free tastes of new ciders. The event is free but space is limited, so you can RSVP here. 12. Gorge on truffles at Roberta’s. Affordable truffles are great, but, okay, maybe you’re looking to splurge. If that’s the case, you’ll want to be at Roberta’s on December 3 for its Truffle & Flow dinner (tickets are $311.49, with service fee). It starts at 7 p.m. with cocktails and canapes like vitello tonnato tartare, followed by courses including the pizzeria’s Cheesus Christ pie with lots of truffles, smoked sasso roulade with melted leeks, and spaetzle with brown goat butter and white truffle. There are wine pairings, as well. 13. Get booza, the Middle East’s stretchy ice cream, in holiday flavors like babka. New York’s only ice cream shop specializing in booza, the stretchy and dense style of the Middle East, is getting into the holiday spirit. Republic of Booza will offer a trio of new flavors (from $5.25 for a small to $8.25 for an extra large) for its first holiday season, including eggnog zabaione, chocolate babka, and panettone. It might be cold outside, but it’s never too cold to eat ice cream inside.